A coalition of leading international free expression and press freedom groups condemns the Turkish government’s refusal to allow supporters to visit journalists Can Dündar and Erdem Gül, who are behind bars for reports claiming that Turkey’s intelligence agency secretly armed Islamist rebel groups in Syria, and calls for their immediate release. Dündar, editor-in-chief of Cumhuriyet, and Gül, the newspaper’s Ankara bureau chief, are being held at the high-security Silivri Prison, west of Istanbul, reportedly awaiting trial on charges of aiding a terrorist organisation, espionage and disclosure of classified documents. The charges remain unclear, as the defendants have not been allowed to review indictments against them. However, the case is believed to stem from a May 29, 2015 report published in Cumhuriyet that included a video purportedly showing Turkish security forces searching intelligence agency trucks en route to Syria containing crates of ammunition and weapons. In recent years, when nearly 100 journalists were held in Turkish prisons, journalists in Turkey were often allowed to visit their imprisoned colleagues. However, in recent months, Turkey’s Justice Ministry has effectively barred most visits for both Dündar and Gül; the only visitors allowed to see them are close family members, lawyers or members of Turkey’s Parliament. Following the Ministry’s recent refusals to respond to visitation requests put forward by journalists’ groups in Turkey and others, a coalition of 11 international free expression and press freedom defenders submitted a joint request on Jan. 8, 2016 seeking permission to visit Dündar and Gül on Wednesday, Jan. 27. The coalition includes the International Press Institute (IPI), the Committee to Protect Journalists (CPJ), Reporters Without Borders (RSF), the International Federation of Journalists (IFJ), the European Federation of Journalists (EFJ), ARTICLE 19, Index on Censorship, the Ethical Journalism Network (EJN), PEN International, the World Association of Newspaper Publishers and News Publishers (WAN-IFRA) and the South East Europe Media Organisation. On Jan. 22, however, Turkey’s Justice Ministry denied the request. In a response, the Ministry cited articles of statute and regulation requiring the Ministry’s permission for such a visit and indicated that the request was denied because permission to visit was not given. The coalition condemns Turkey’s refusal to allow supporters to visit Dündar and Gül, who were held in solitary confinement for 40 days before finally being allowed to share a cell together early this month, as well as the charges against them. The persecution of these journalists in retaliation for having reported on a matter of urgent and undeniable public interest, and the refusal to permit visitation in the manner that any other prisoner would be allowed, represent a violation of their rights and a gross abuse of authority. This wrong is compounded by the fact that neither Dündar nor Gül have been convicted of any crime, much less informed of the allegations against them. The misuse of anti-terror law against these journalists is only the latest in a litany of such cases in Turkey, and joins a list of developments that illustrate growing authoritarianism and a blatant erosion of human rights. They include politicisation of the judiciary, the similar abuse of other criminal laws, the imposition of outright bans on disseminating certain content, the use of state agencies and economic levers to silence media outlets, verbal and – in some cases – physical attacks on critical journalists, and the orchestration of online hate campaigns targeting government critics, among others. 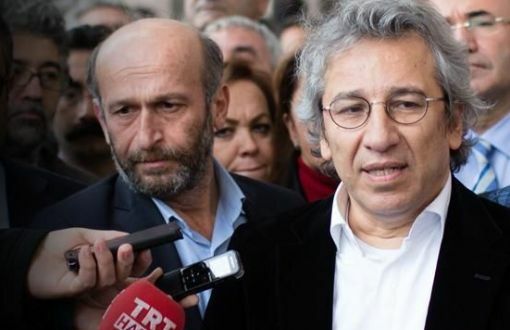 The coalition accordingly calls on Turkish authorities to free Dündar and Gül without delay, to drop all charges against them, and to free all other journalists currently detained in connection with their journalism or the opinions they have expressed. It further urges lawmakers in Turkey to take steps to reverse the country’s trend toward authoritarianism and urges the governments of democratic countries to pressure the Turkish government to meet its human rights commitments under domestic and international law.